++ Designed for one or two person jobs. 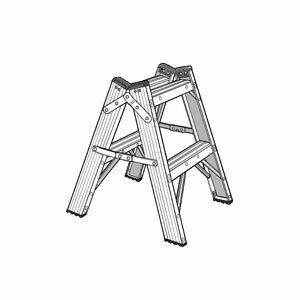 Note: When used as a double stepladder, the maximum load per side, including person and materials, shall not exceed the duty rating of ladder. Note: Planks or platforms shall be secured to the step stools. The ends of each plank or platform shall extend beyond the outside edge of each step stool by a minimum of 4 inches and a maximum of 10 inches. Model No. Size Approx. Width Approx. Spread Approx. Cu. Ft. Per Unit Approx. Shipping Wt. Lbs.